Firstly you’ll need to clean your pool and ensure that your poolside (and anywhere else that your guests may visit) is clean, presentable and safe. A priority is to check the swimming pool chemicals, ensuring that the balance and all levels are correct. Lay out plenty of clean towels, ready for your guest’s arrival or, alternatively, make clear on your invitations that you would like guests to bring their own towels and bathing wear. It is also a good idea to have a foot bath available that allows you to easily change the water. By doing so, people can then clean their feet prior to swimming, especially children who may have been running barefoot around on the lawns. Depending on the size and nature of your pool party, you may wish to consider hiring a lifeguard. Hosting and monitoring a pool party is a big responsibility and can be difficult, so hiring a lifeguard may help allow you to relax and enjoy your party. If you have pets that may cause a problem, make sure they are confined away from your guests. 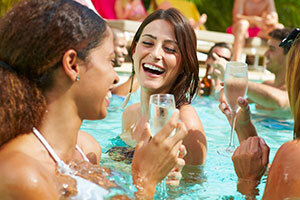 Here are some things to consider when hosting your own pool party. Call your guests before the party to remind them to bring the essentials. Whether we’re talking sunscreen, towels or swimsuits, some guests are sure to forget something. For those guests that still forget, try to have plenty of spare bathing suits, towels, waterproof sunscreen and t-shirts (for those that burn easily). This may help to ensure that all of your guests get to join in the fun. If the only toilet you have is inside, make sure the route to the toilet has a place for people to dry their feet – this will prevent children from slipping when running into the house. As people will be using the pool, remember to keep refreshments light. Perfect pool party foods include salads, fruit, raw vegetables and dips. To make serving your guests easy, lay your food out on large tables in shade with plenty of serving utensils, napkins, plates, knives & forks as well as plastic cups to avoid having glass near the pool. Ensure you have plenty of drinking water and non alcoholic drinks such as pineapple and fruit punch as alcoholic drinks and swimming pools do not always mix. If you intend to provide, or allow, alcohol, consider what could be done to limit possible safety issues. Provide seating for your guests: lawn chairs or woven mats will provide a place for your guests to relax and dry off. If you’re short on seating, you could ask each guest to bring a chair, and if your poolside lacks shady areas, consider creating shade, perhaps with the use of umbrellas or gazebos. Consider designating two rooms within your house, a “Boys and Girls” room so to speak, as a private changing area. Some guests may need a place private, away from other guests in which to get changed. Everyone remembers a good pool party game. There are loads to choose from so research a few before hosting your party. Stock up on amusing pool toys including beach and splash balls, floats, rafts, and even water guns. Volleyball is a great game and it always gets those competitive people into the pool. If children will be attending your pool party, you will have some additional safety considerations. If they are young children, ensure that they have parental permission to enter the pool and try to gauge their level of swimming and ensure that the pool is never left unattended. Make sure you have some arm bands and goggles, as these are often forgotten and could spoil a child’s fun. Background music can really help to liven-up any pool party. Think about which types of music will help provide the right atmosphere for you and your guests. Also consider your party décor. Will you have a theme, such as a beach theme? Can you use candles or lanterns to set the mood when the evening draws in? Have you hosted a pool party? Do you have any winning tips or tricks to share? Ever had a pool party disaster? What are your favourite pool party songs? Let us know. Get in touch by leaving a comment below.